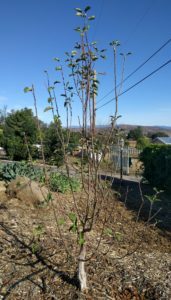 Whether or not you should prune a bare-root fruit tree depends on two things: One, what the tree looks like when you buy it. And two, what you want the tree to look like when it’s all grown up. 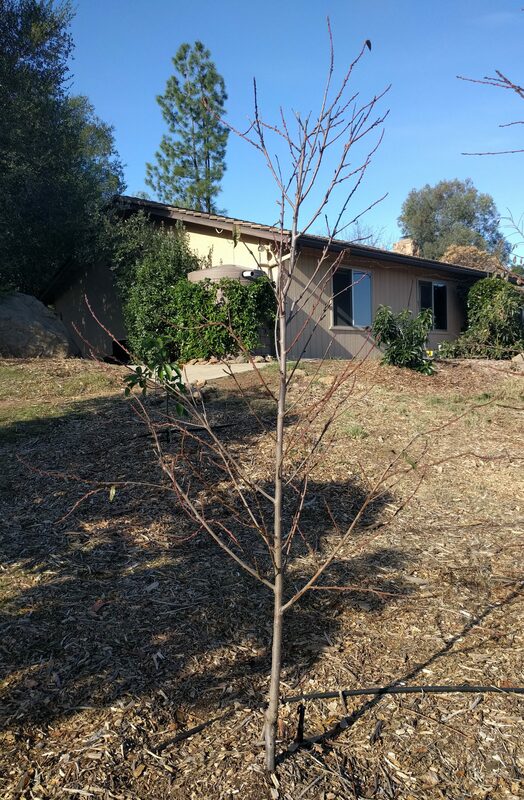 This being mid-January, heart of bare-root season in Southern California, I just planted a few trees in my yard and went through the process of deciding what to prune. So let me use those trees as our real-life examples. 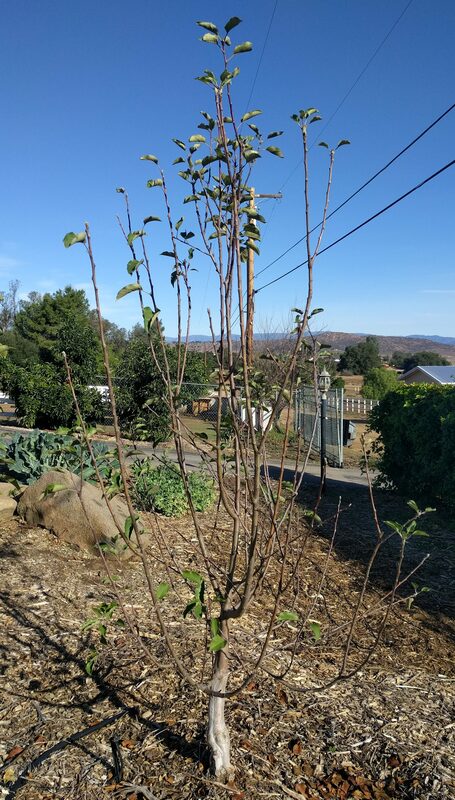 Meet my newly planted Fan-stil pear tree. Nice branch structure, wouldn’t you agree? Looks like a . . . tree. The trunk tapers from bottom to top; the branches are spaced vertically up the trunk; the branches spread into a pyramid shape, where the lower branches are bigger and wider. And what you can see from the photo at the very top is that the root system on this tree is also respectable. Thank you to the tree’s grower, L.E. Cooke (R.I.P.). I won’t be pruning this tree at all until next year. One, it has all the above good qualities straight out of the nursery. And two, I want the tree to have a pyramid shape when it’s all grown up. 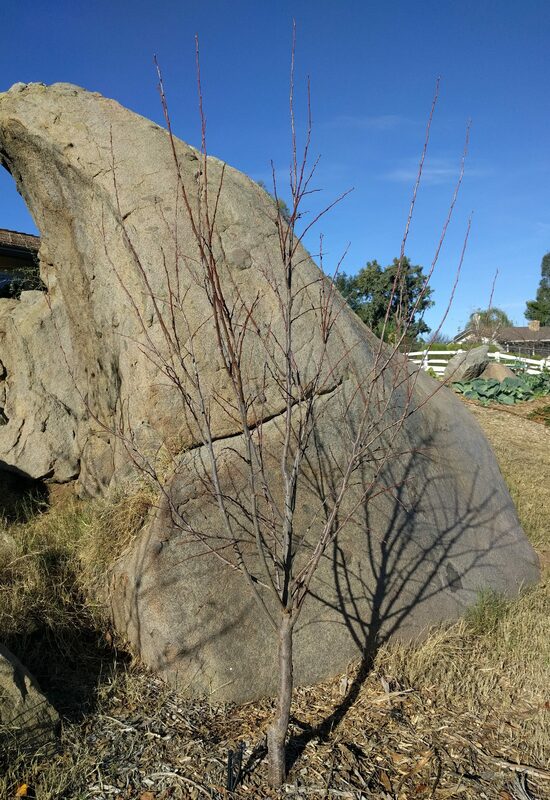 If I wanted this tree to have a globe shape (called “open center” among fruit growers), I would make one pruning cut to my pear upon planting. I would simply cut the trunk right above the fourth branch from the bottom. 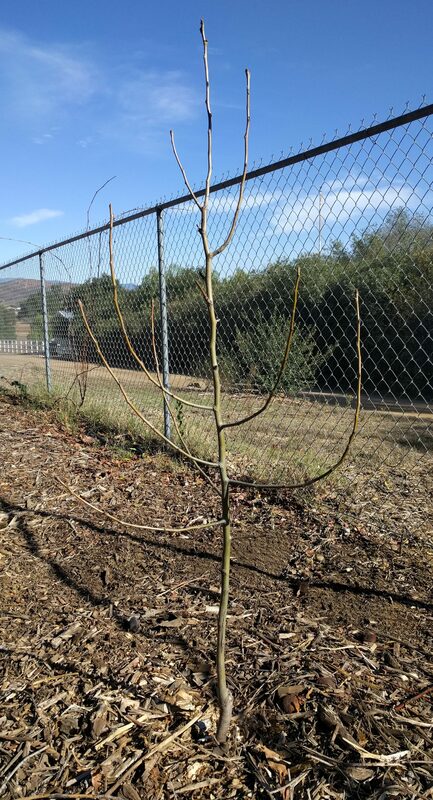 But in my experience growing apples and pears in Southern California, a pyramid (“central leader”) shape works better. 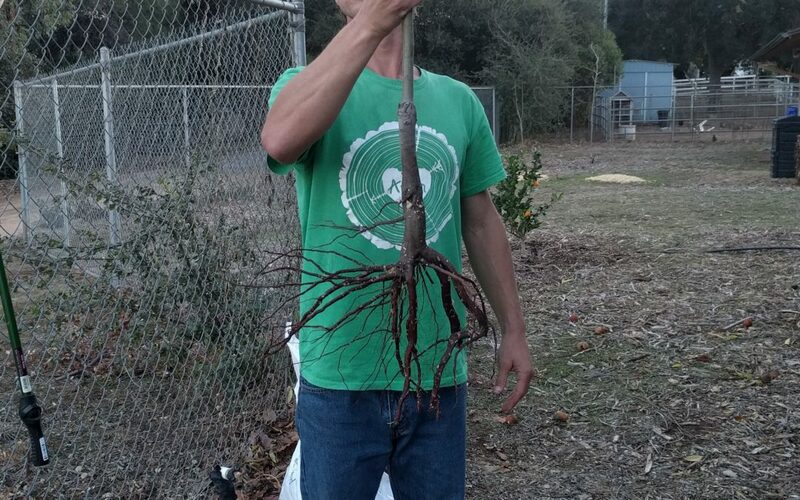 The idea is that the roots get cut or damaged some when the tree is dug up, and so now it has a proportionally larger trunk and branches compared to root system. I heard that too, for years, and so I followed the advice. Sometimes nursery workers can get really pushy with this advice, making you feel guilty if you don’t let them cut some of the branches off your bare-root tree for you at the time of purchase. The pruning of bare-root trees does make theoretical sense, at least. But point me to the evidence, please. A few years ago I performed my favorite type of experiment: Not doing something. What would happen if I didn’t do this “balance” pruning? 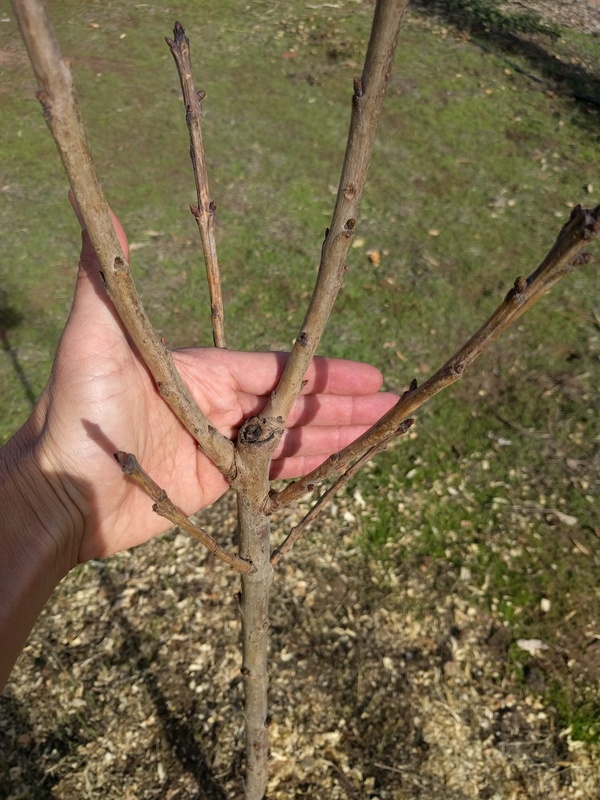 My conclusion is that you can follow the common advice to prune bare-root fruit trees back at planting time and they will grow fine, or you can leave them alone and they will grow fine. At least, that’s been my experience. Pruning is work. I work only when necessary. 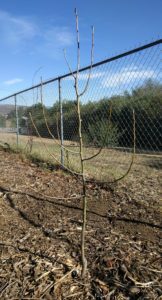 But sometimes pruning is necessary, for example, if your bare-root fruit tree looks like this. Meet my newly planted Royal Crimson cherry tree. “That’s a tree?” you ask. 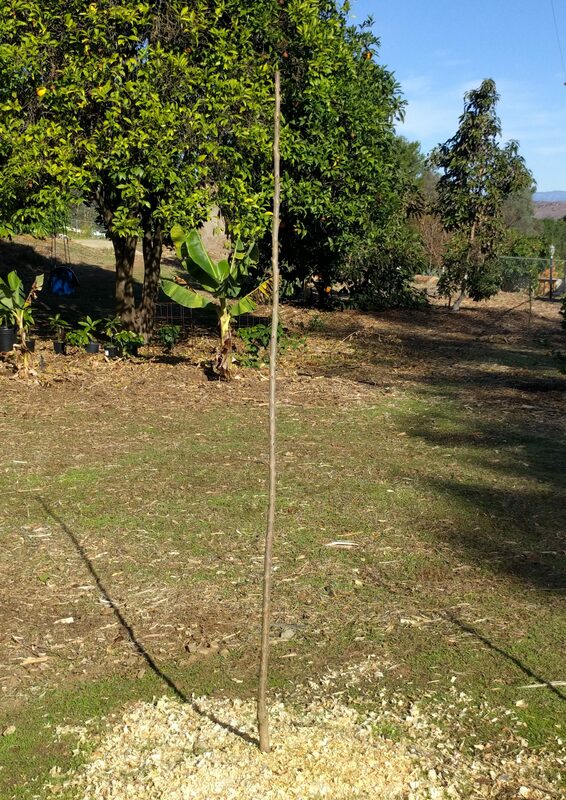 “Looks like a stake.” In the jargon, it’s called a “whip” when it has no side branches like this. 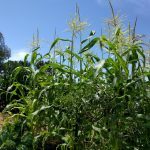 For me, the buyer and future grower of the tree, it’s not optimal, but sometimes you can’t find a well-branched tree of the variety you want. 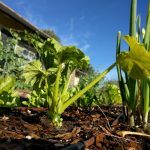 So you manage — by making a pruning cut. If I were looking to have a mature cherry tree that is very tall, say twenty feet or more, then I could plant this whip and walk away and never touch it with my pruners. It would grow into a tall, branching pyramid of a tree on its own. However, I want a smaller, low-branching tree. This whip is about five feet tall, but I want side branches to form starting at three feet from the ground. Cutting it at a few inches over three feet from the ground will cause it to form those side branches where I want them. Lapins cherry tree, branching below a “heading” cut. This is another bare-root cherry tree that I planted by the above Royal Crimson whip. What the close-up photo shows is that while this Lapins tree was growing in the nursery grounds, it had been cut. Below this cut, branches emanated, up to about five inches down the trunk. This is likely what my Royal Crimson whip will look like next winter, after I make the same kind of “heading” cut here at planting time. Then I’ll have the low branches I want for my grown-up tree. One last thing to keep in mind is that a branch’s position on the trunk never changes. If a branch grows out from the trunk at three feet off the ground, it will always be at that height. The tree will grow taller, but the height of that branch on the trunk will not raise off the ground as the overall height of the tree does. Hope all of this helps this winter as you consider whether to leave your new bare-root fruit trees alone or give them some directions through pruning cuts. 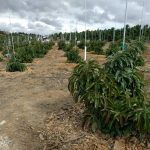 I just want to note that despite the Dave Wilson recommendation to cut even multi-bud trees back to 1/2-1/3 on each branch, this advice DOES NOT APPLY TO PEACHES. I learned the hard way. I cut my newly bought DW multi-bud peach back and only 3 of the 5 grafts survived. I am still fuming. Turns out peaches do not produce as many latent buds as, say, plum. 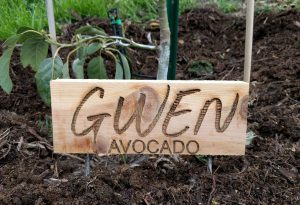 I’m so glad I found this piece before I cut back the two bare root peaches I just planted! Thanks for the helpful information, and I ordered my own copy of the Home Orchard as well! 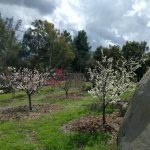 Great to hear this, and you will not be disappointed with The Home Orchard. I’ve been reading through sections for the umpteenth time just this last week.